In reflection, each area of my life has been impacted while studying positive psychology. Initially, I expected to be challenged and anticipated to grow both personally and professionally as a result. It’s been quite a journey. 1.) Family. This involves how I relate with others, the way love and relationships impact and influence my life and how to parent my two children, Laura (7) and Dylan (5). 2.) Business. Managing the multitude of tasks from time with clients, presenting positive psychology concepts to professionals and the administrative and marketing roles relating to coordinating a team and growing a business. 3.) Balance. The way I juggle consistently working to improve things and being present and engaged with the simple moments life offers. I work to keep balance top of mind in my life, and this course has had a profound impact on how I view it and the functionality of managing my time, energy and focus. Within this blog I’ll focus on my experience with positive psychoogy theories, concepts and ideas with my relationships and my work. There are multiple elements that have been woven together, in many colourful, and unexpected patterns. Here I’ll share how the journey has unfolded and the learnings that I’m putting into practice in my life. There is nothing quite as impactful on my personal wellbeing as my relationships with my family. Just as the article by Antonella Delle Fave et al highlights, (Delle Fave, 2011) as for almost 40% of respondents, family creates the most meaning for me. During the first intensive at Uni we were confronted with the ubiquitous term ‘wellbeing’ and challenged to define it and understand the constructs that it is built upon. This task lead me down the path of self-awareness, of what I thought my wellbeing was constructed of, and the realisation that the elements had changed so quickly with the start of the year. Personal stress was building and reading over one of the articles, (Delle Fave, 2011), I realised that just as many people identified that harmony and balance were central to their happiness, so it was in my own life. Awareness, unfortunately, does not recreate balance. On reflection of my own parenting and relationships, I became aware that my self-awareness and ability to perceive, express and manage my own emotions diminishes as my workload increases. This lack of emotional intelligence led to increased tension in our home, strained communication with my husband and significant behavioral issues with both children. I felt that I had a reasonable understanding of Fredrickson’s Broaden and Build Theory (Fredrickson, 2001) for some time and invested heavily in creating positive emotions within my family. We have a fun jar, talk about things we’re grateful for over dinner, and often end the day with the ‘three good things’ exercise. However, reading the article ‘Changing behavior through TV heros’ by Melissa Dittmann, in the text book (Lopez, 2015) helped me to relate to Bandura’s ‘social learning theory.’ I realised that what I did was so much more powerful than what I said, and in practice, I had become a pretty average role model. Despite the fun and powerful positives, I was actually, often placing work above family, and becoming more distracted and distanced as the workload and stress increased. Beaumeister’s article (Beaumeister R. B., 2001) was the proverbial icing on the cake and when I realised how ‘Bad was stronger than good’ in so many ways and facets of life. I started to think that perhaps my constant quest to make things better isn’t as important as simply ensuring the bad things don’t get out of control. It helped me to understand why yelling and screaming works in the moment, (and seems to be our impulsive reaction) and pushed me to search further. In my constant quest for answers, I read Coulson’s 21 Days to a Happier Family (Coulson, 2016). I came to the fast realisation that I was damaging my relationships and that when the relationships are right, discipline diminishes back to directing and teaching in moments of calm. The ‘comments on love research’ within the text (Lopez, 2015) outlined one research project where participants were asked to define what they actually meant when they said, “I love you”. This struck me as a beautiful project, and something I could easily replicate in my home and start towards modeling positive behaviour’s. I wrote a letter to my children stating how I viewed their strengths and what I meant when I said I loved them (Cooper, 2018). At 7 and 5, I wasn’t sure how they’d react, but my son (5) often asks me at bed time to read him the letter that lives in his top drawer. I’ve also noticed that my daughters letter keeps moving, indicating that although she doesn’t speak about it, perhaps she’s reading over the note too? I enjoyed the concept of the parenting paradox (Beaumeister R. V., 2013) and felt validated in the experience that happiness often declines with parenting. In speaking with other parents during the MAPP, it’s apparent that juggling family responsibilities certainly adds another layer of complexity to undertaking the program. It’s also a blessing to think that as we juggle the dynamics of parenting, our meaning increases, giving us a balanced approach to personal wellbeing. (Beaumeister R. V., 2013) In theory at least. Over the past three weeks, I’ve been working towards building more emotional intelligence. This self-reflection has guided me to talk less (much less), listen more (much more), and really focus on creating high quality connections (Ryan, 2018) within my family. As a result, my relationship with my husband has grown and the children’s behavior has improved considerably. I appreciate it’s a new stage, however, taking the time to reflect and really change the way I was dealing with my own emotions, has had a remarkable impact on my family. I’m certainly going to work hard to ensure the positive change lasts. Our ‘Emoji book’ as we’ve named it, has some simple emoji’s to help us start to identify our emotions, a list of meaningful activities to do together, the letter of what ‘I love you’ means for us both, a drawing of our strengths that we can build on, a section of ‘what went well’ (Seligman, 2011, p. 33) and some eject buttons, or things to do when we feel like we’re loosing our cool. Nothings perfect, but I’m excited about working on the project with Laura that will ensure the theories get put into practice in our family over the years to come. The future-self exercise, in intensive 1 was not something new to me. In a business course (Beaumont, 2018) I’ve been competing it’s something we do each quarter in order to create a clear vision of what we are trying to create and the impact we can have through our work. The power of it is incredibly motivating and inspiring, so to start the course with the positive direction personally and for my business was brilliant. I’m also doing more of this with my clients. In writing the third intensive blog (Cooper, 2018), I reflected on how my initial challenge was in learning to assess and pull apart the various theories and think critically about what they bring and perhaps also, what they may lack. To say I enjoy reading and learning new things is an understatement, and the fact that it had never occurred to me to challenge the things I was learning, left me feeling gullible to say the least. I found in my business as a coach and presenter, I was questioning my work, feeling a little like a fraud and totally out of my depth. I thought I was a good coach, and I knew that my presentations impacted people in positive ways. However, my confidence diminished as I realised my shortcomings and started to discover how little I really knew. It felt like to move forward in my business, I literally had to let go of what I thought I knew, unlearning and relearning and delving into new ways of thinking. Moving forward, during both my business and life as a student, I constantly come back to the first day, when Lindsay spoke about just having a go, and moving on. Not trying to get things perfect, not overthinking everything, just making progress. This has been a guiding light for me. Being curious about my personal stress load and how my brain is and isn’t working, I also consumed ‘Your Brain at Work’ by David Rock. There were many insights thought the book, not only for my own personal benefit but also relative to the MAPP, my clients and audiences. Rock spoke about the modern-day conundrum of multitasking (Rock, 2009, p. 36) and how our attention is damaged by constantly refocusing from task, to email, to phone, to other interruptions. The term he uses is allostatic load, where the brain is under constant pressure to perform, increasing the adrenaline and cortisol levels and reducing productivity. Rock quotes a University of London study that found multitasking reduced metal capacity in women by an average of 5 IQ points, and men by 15 IQ points (Rock, 2009, p. 37). The study likened the effects of multitasking, to the mental capacity of someone smoking marijuana or missing a full nights’ sleep. Learning this effect was profound for me. Not only was the term ‘allostatic load’ now ringing in my ears, I became acutely aware of how I worked and attempted to reduce distractions as much as possible. A little more research and a I found a technique called Pomodoro (Henry, 2014), the concept comes from a timer used for cooking tomatoes. Essentially, it’s an alarm designed to keep you focused and on task for 25-minute blocks. It then enables you to get up and move and stretch for 5 minutes, before returning to the next block of work. I’ve found it incredibly helpful and am now introducing the idea to my clients and audiences with much success. A simple concept, but the way my brain is learning to stay focused on study and work has increased my productivity dramatically. Positive Psychology has been a natural fit for me. I was fortunate to have a business coach 15 years ago, and at that time felt drawn to the coaching field. Completing my coaching studies 12 years ago, my sense of meaning was always strong. 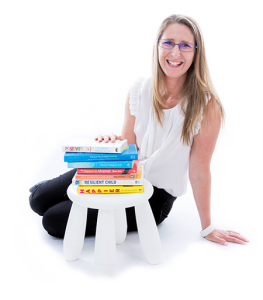 I am highly connected to making a difference in my clients lives and am driven to promote wellbeing at a wider level through my work, our local schools and wider community. The fact that my depth of meaning coincides with higher stress, worry and challenge fits with Beaumeister’s findings (Beaumeister R. V., 2013) and helps me understand the pressure I feel within my work. I’ve long been interested in kindness and altruism and reading over the ‘innocent bystander effect’ (Lopez, 2015, p. 314) lead me to reflect on the ‘good Samaritan’ study. (Darley, 1973) Re-reading that article again, I recalled how insightful the findings were. Darley indicated that only 10% of Seminary students stopped to help a man, in obvious distress, when told they were running late. The core message I took away at the time, was to avoid getting so busy that I stop noticing opportunities for kindness. It was a timely reminder that the busier I become, the less I’m able to support, empower and help others. Lindsay mentioned, during a conversation about Grit, that many constructs can be seen through the lens of being either tough minded or tender hearted. I began thinking over the concepts and applications I share with my clients along these lines. Lindsay didn’t delve into the idea, but I like the way it sits within positive psychology. Many clients initially come to me with the impression that I’m a ‘tough minded’ coach and that my role is to push them to achieve their goals, to dream bigger and do more with their lives. In reflection, I believe there is a place for achievement and goal setting, but the concept of being tender hearted means embracing self-compassion, developing self-efficacy, and certainly slowing down to enjoy the journey mindfully. Moving forward, I hope to blend the tough minded and tender-hearted concept into my work as I think it’s a simple analogy that will work for others as it works for me. It became apparent in the last intensive that I often overuse my strength of curiosity. Curiosity leads me down innumerable rabbit holes, reading book after book, in search of new learnings, ways to comprehend different challenges, and understand new theories. During the last three months, not only did I attempt to read the ‘additional’ readings, I also followed various interests, leading me to read books on family, neuroscience, marriage and wellbeing. It has also never occurred to me that kindness, as a strength could be overused. However, during the exercise that had us discussing which strengths we overuse, kindness came up in three of the five people l spoke with. In 2016 I founded a simple movement called the ‘Kindness Crew’ (Cooper, 2016) in the attempt to promote kindness at home, school and in the workplace. The realisation that kindness can be overused has important implications in how I promote kindness. In the future I will be looking further into prosocial behavior and the impact of compassion fatigue, kindness overuse and how organisations can implement strategies that reduce burnout and optimise wellbeing. I have also begun to share this concept of overusing strengths in workshops and with clients. I’ve been delighted with the quick insights people gain from understanding that moderating an existing strength is sometimes more important than developing a new one. Moving forward, I intend to pace myself more and temper my strength of curiosity with my strength of appreciation of beauty and excellence, which seems to slow me down and reengage me with the present moment. Reading over Strengths of Character and wellbeing (Park, 2004) and completing the life satisfaction questionnaire, It seems that my results correlate with their key findings. Having done the VIA strengths assessment 3 times over the last 6 years, I’ve had hope, zest, gratitude and curiosity in my top 7 strengths each time. My life satisfaction is pretty high, and I wonder if perhaps not only have they influenced my life satisfaction, but also if my high life satisfaction has also enhanced these core strengths? I’m curious to see how these strengths will develop in years to come. My yoga teacher earlier this year shared a concept called Santosha. It’s not a term I’d heard before, and certainly not something I’ve come across in positive psychology literature. Researching online, I found little more than the meaning of the Sanskrit term ‘entirely and contentment’. My yoga teacher likened it to the point in a yoga position where you are stretching and challenging your body, straining to achieve a new position and at the same time you accept your physical limitations and find deep contentment in the moment. The term resonated deeply. Moving forward, I will work to fold my learnings from The Principles of Positive Psychology into my family life and my business. As I do, I will keep the concept of Santosha as a guiding principle. Maintaining a balance between striving and accepting, between working harder and enjoying the moments, will become a central theme of my life. With Santosha, I believe that not only will I be able to create positive social change, I’ll experience plenty of pleasure along the way. Perhaps this subject has simply led me to clarify my personal experience of eudemonic and hedonic wellbeing at play? Beaumeister, R. B. (2001). Bad Is Stronger than Good. Review of General Psychology, 323 – 370. Beaumeister, R. V. (2013). Some key differences between a happy life and a meaningful life. The Journal of Positive Psychology, 505-516. Coulson, J. (2016). 21 Days to a Happier Family. Sydney, Australia: Harper Collins Publishers. Delle Fave, A. B.-B. (2011). The Eudaimonic and Hedonic Components of Happiness: Qualitative and quantitative findings. . Social Indicators Research, 187. Fredrickson. (2001). The Role of Positive Emotions in Positive Psychology: The broaden and build theory of positive emotions. American Psychologist, 56(3), 218-226. Fredrickson. (2009). Positivity. Groundbreaking Research to Release You Inner Optimist and Thrive. Oneworld Publications. Lopez, S. T. (2015). Positive Psychology: The Scientific and Practical Explorations of Human Strengths (P. 135). California, USA: Sage Publications, Inc.
Park, N. P. (2004). Strengths of Character and Wellbeing. Journal of Social and Clinical Psychology, Vol. 23., 603-619. Rock, D. (2009). Your brain at work. New York: Harper Collins Publishers. Ryan, M. (2018, March ). TREE theory explained during MAPP Intensive 1. Melbourne. Seligman, M. (2011). Flourish: A visionary new understanding of Happiness and Wellbeing. New York: Atria Paperback.